The first community in Burnet County to be named Mahomet was only a few miles NE of present-day Bertram. The community was named after the city of Mahomet, Illinois by early settler George Alter, a former resident of that city around 1853. Alter’s home was very near a stage line which began service in 1855, operating between Lampasas and Austin – a perfect place to start a town. Alter applied for a post office in his home which was granted in 1857. It remained there for the next 25 years. In 1882 the town was bypassed by the railroad (the Austin and Northwestern) who decided to establish the town of Bertram. Moving the post office to Bertram would be logical, however it was moved to Sycamore Springs, a community ten miles NE of Bertram near the Williamson county line. The name of the community thereafter became Mahomet. In the mid 1880s the town had a population of 50 served by a steam corn mill, a cotton gin, school, and church. Population estimates rose to 60 for the 1890 census but declined drastically to only ten residents in 1896. 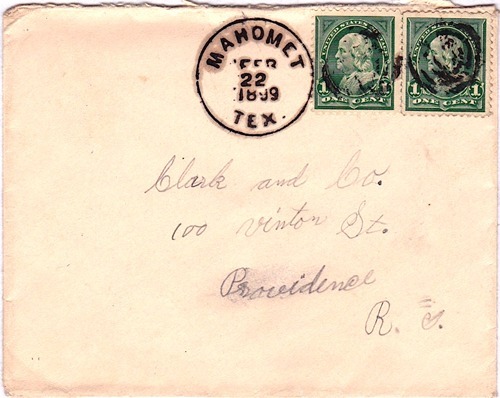 The Mahomet post office was closed in 1916 and thereafter mail was routed through Bertram. The population was 40 in the late 1930s and rose to a high-water mark of 75 in the 1960s. It has settled in at 47 residents – through the 2000 census.